Invited for first time to eat dinner at my daughter and her husband’s apartment. They were married in October. I thought a special bottle of wine would be appropriate to start off the night and to toast their first and hopefully many more dinners. 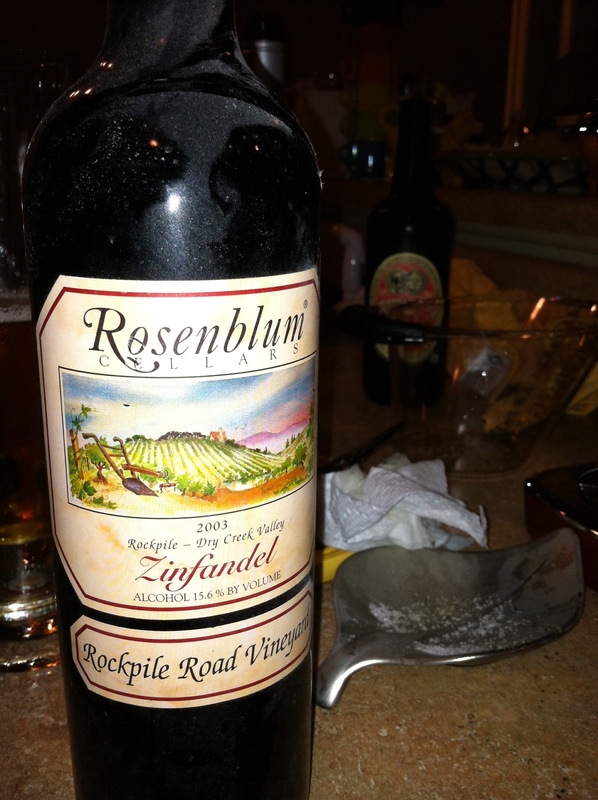 I chose my last bottle of Rosenblum Zinfandel, Rockpile Road Vineyard 2003. This bottle was rated third in Wine Spectator’s Top 100 in 2006. The wine was spectacular. This zinfandel was port-like without being over the top. Great blackberry, fruit overtones in this very smooth wine. It met everyone’s expectations. As for the food, the theme was from the famous Italian New Orleans restaurant, Mosca’s. We had a rendition of their Chicken à la Grande and Spaghetti Bordelaise, along with a nice salad. Olive oil and garlic was had by all. Quite delicious! If you want the recipe for Chicken à la Grande, go to http://www.moscasrestaurant.com.